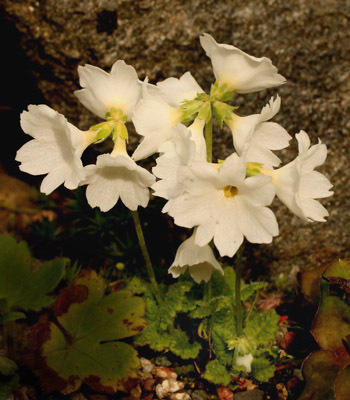 This beautiful little Primula with its delicate thimble shaped corolla was discovered by Alexander ('Sandy') Wollaston while engaged in reconnaisance for the Mount Everest Expedition of 1921. 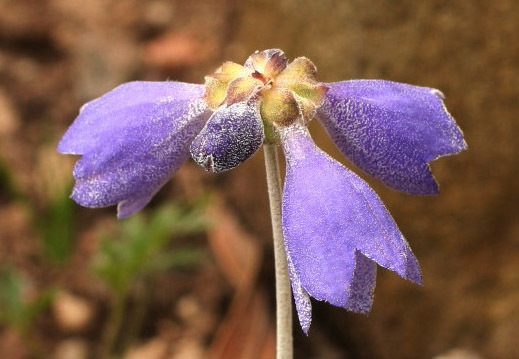 It was found growing at approximately 4550m. in E.Nepal. Elsewhere it occurs in Central Nepal and neighbouring areas of Tibet, its distribution being generally associated with heavy summer rain fall. Since then it has been introduced into cultivation a number of times. 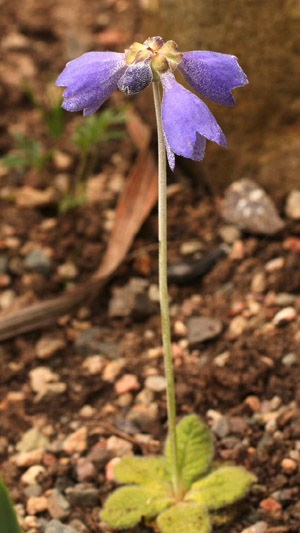 It is a member of the Section Soldanelloides which includes P.buryana, P.cawdoriana and the well established P.reidii (which is included here for comparison). I obtained the seed from a collection made in the Solu-Khumbu Region of East Nepal (CC 5778).The accompanying note suggested that the species collected might be P.wigramiana with which P.wollastonii is known to hybridise but when it finally flowered it proved to be closer to the latter species, a determination which was recently confirmed by Wendy and John Mattingley of Cluny House Gardens. A number of the plants now grow in the open ground in an area of the garden with decent drainage, but I suspect that their continued survival may be due to our recent very wet summers because generally taxa in this section of Primula hate hot weather. Seed set is not very good but, because the plant is rhizomatous, small plantlets can be detached periodically and grown on. My plants are still a bit too young to attempt this procedure. For anyone interested in this group of high-alpine Primulas I strongly recommend Pam Eveleigh's website, (www.primulaworld.com) where there are some beautiful images demonstrating the range of colour forms possible within this species, together with some stunning habitat shots.